Everyone suffers from information overload in our society today. It’s a 24/7 world with smart phones, computers, instant news, colleagues, friends, and even family bombarding us. Information is essential to making intelligent decisions, but more often than not, it simply overwhelms us. It’s like trying to drink from a fire hose. 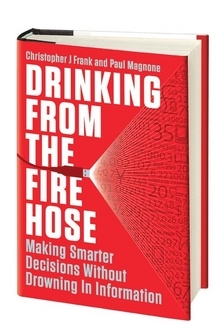 Authors Christopher Frank and Paul Magnone, in their recent book Drinking from the Fire Hose, propose a simple solution: Learn how to ask the right question at the right time. Whatever field you are in, asking smarter questions will expose you to new information, point you to connections between seemingly unrelated facts, and open new avenues of discussion with your colleagues. Here are the seven questions that the authors think will help you bring a big-picture perspective to problems that often leave others buried in irrelevant details. What is the Essential Business Question? Asking the right question is the key to finding the indispensable answer in the mountain of information. Where is your customer’s North Star? Shift your view from company-centric to customer-centric. Should you believe the Squiggly Line? Question the validity of short-term data. Uncover hidden information and use it to change the dialogue. What does the lighthouse reveal? Identify the risks, barriers, and bridges that surround your business. Who are your swing voters? Drive growth, increase revenue, and boost satisfaction by looking at your existing customers in a new way. Follow this easy-to-remember sequence of questions to effectively communicate results and inspire action. Frank and Magnone illustrate these seven questions with real-life stories and applications that you will find helpful in surviving the deluge of data that is your life.